I barely made it to Aldi yesterday, but we were out of bread and orange juice and Aldi is the best place to buy this. Last week the boys were sick, and this week it was my turn, so I have not been writing much. In fact I did not feel like dragging myself to the store at all yesterday, and the thought of having to get on the bus with two boys was not attractive either. However, my husband needed his orange juice and eggs and decided to drive carve out room in his busy work day to drive me to Aldi, wait for me and drive me home again. 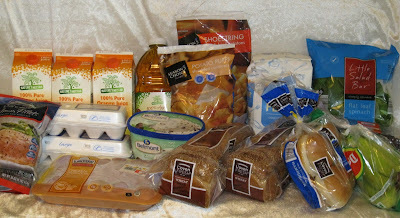 This means that it was a very quick Aldi trip, but I got what we needed, and our grocery budget sure loves Aldi. The price increases are not huge, and I am not surprised to see them after seeing a lot of price hikes at both Target and Publix. My guess is that this is their way of putting the increase in gas on to the consumers. Unfortuantely Aldi did not have any oranges in stock, I was really looking forward to getting some cheap oranges, as they are great for a vitamin C boost. *I will have a new grocery price comparison list up this afternoon. Have you noticed any price hikes at your local Aldi store? I would love to hear about your shopping trip, you can link up below so we can easily find it, or you can leave a comment. Grocery prices are going up everywhere! At ALDI, I saw the bread price on Wednesday as well. Eggs were still 99¢, though. The egg price increase could be because of the upcoming Easter and Passover holidays and the increased demand for eggs. I am going tomorrow again for a few things, so I will check! I also went to Aldi yesterday and noticed a big jump in meat prices...hamburger is now 3.39lb and pork chops are 3.49lb! 6mos ago they were both 2.99lb. Our milk price jumped from .99 to 1.49 in 1wk recently too. Laura,you are lucky still to have the $0.99 eggs, I sure hope they go down again. Kim, I agree about the meat, I was looking and the beef looked more expensive. I only bought the chicken though which was still at $1.29/lb, which is cheaper than where I regularly shop. It might seem like big increases, but when you add it all up, it turns into $2 - $5 more per grocery trip. A friend told me about this linky...I will visit often! Aldi's produce is still the best price in my area, comparied to the competition. I'm also seeing the price increases: my favorite %0.99 tortilla chips are now $1.19; apple juice went from $1.19 to $1.29. My eggs are $1.39. For some reason my comment didn't save last night??? @JR - I went today, and eggs were $1.29. Wish I had bought a couple more dozen earlier in the week. And I noticed bananas were up to 44¢/lb. Andria, Aldi really does have some great prices on produce. Our apple juice went up as well. Amanda, you are very welcome....I'm afraid there will be more as well. I just did the price checks at Target and Publix, and I have a lot of work to do on the price comparison list today, it's amazing how much everything increased in a week. Laura....not the bananas! I sure hope they do not go above the $0.44. Publix actually have the cheapest cucumbers this week, as Aldi's are up at $0.89 each. Thanks for the link-up again, JRFrugalMom! So sad to see prices increasing at ALDI, as well. It makes it all the more important to stick to a reasonable budget & shop strategically! Our bananas were up to $0.44 too, and all green! I have to wait for them to ripen. And our cucumbers were up to $0.79...they had been $0.50, but the hubby loves them for a late night snack. Cheaper and better for him than a lot of things I suppose. Sort of scary to where these prices might go. Nice at least that gardening season is near for most of the country--that will help some. Donna, it really is more important than ever. Amanda, there were only a tiny bit in my Aldi, and they did not haev any oranges:( I got the green bananas, but they go yellow in a day here in South Florida unless we have the A/C on. Cheryl, you are right, it is scary...and I am sure gardening will be a big help for many. I am definitely enjoying that I do not have to buy tomatoes, and I actually have lettuce growing now...for the first time in Florida. The bread is still at the "try me" price of .99 cents. and we notice a huge hike in fresh veggies and fruits. I was surprised to find the frozen orange juice concentrate at $1.09. Thank you for stopping by the Aldi Spot Susanne. Is the bread the regular kind or the whole wheat? I was sad to see our whole wheat bread go up this week? I actually noticed the orange juice concentrate this week, and I wondered what it would taste like. Have you tried it? We are big orange juice drinkers in my family. Has anyone ever tried the Fit & Active Turkey Franks? They were $1.29 for 16 oz. (10 hotdogs) at my store yesterday. I'll be trying them out for the first time sometime this week. Donna, I haven't tried them (I'm a vegetarian), but I have been considering getting some for my son. I would love to hear what you think of them.